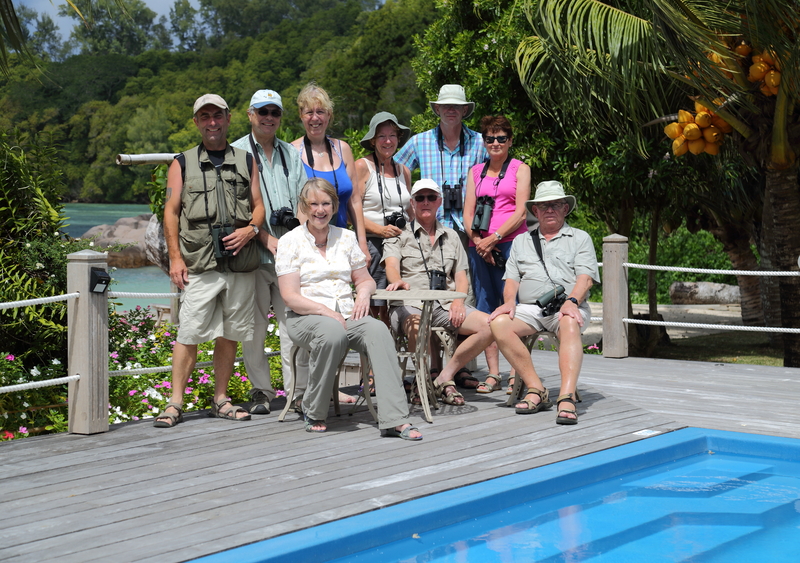 Arriving on Mahe, the birding begins with a lovely little Seychelles Kestrel sitting on the girders inside the open plan airport building, while the airport café clientele includes sparrow-sized Barred Ground Doves around our feet! After the long haul flight to The Seychelles, it’s a short ‘hop’ across to Praslin in a nineteen seat Twin Otter, just like the ones used to and from The Isles of Scilly, and we pass the time waiting for the onward flight spotting Madagascar Turtle Dove and Seychelles Sunbird right outside the airport building, with White-tailed Tropicbirds and large raptor-like Seychelles Fruit Bats flying around the steep granite cliffs above Victoria town. This morning we have a visit by catamaran to nearby Cousin island, and by the time we set sail, we have already spotted a Green-backed Heron in a palm tree lining the beach and a Greater Crested Tern sitting on a granite rock just offshore. We arrive off the landing beach on Cousin just in time to see a Hawksbill Turtle come up for air right in front of our anchored vessel before diving again without further trace. A small boat picks us up from the catamaran and hurtles towards the beach at full throttle to propel us well clear of the surf in the style of the Special Boat Squadron! 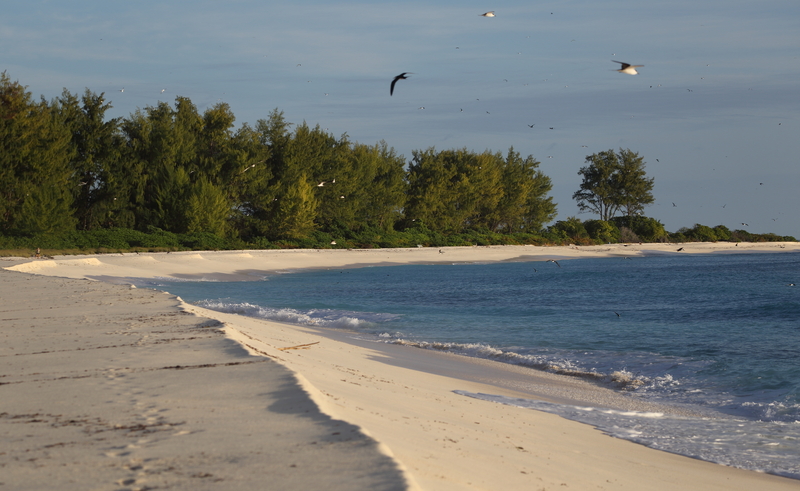 Once ashore, the trees are full of nesting Lesser Noddies and so every inch of the ground, and even the Giant Tortoises, are splattered with whitewash! We soon find the rare Seychelles Fody, quickly followed by the equally rare Seychelles Warbler, showing really well, and as one sits directly above me I narrowly miss getting pooped on! Next on the list are a trio of tame and inquisitive Seychelles Magpie Robins, so that’s the three target birds safely ‘in the bag’. Meanwhile, the leaf litter is crawling with life including Hermit Crabs, and endemic Bronze-eyed Geckos and chunky Wright’s Skinks, and there seems to be a White-tailed Tropicbird nesting beside every large tree buttress along the trail which leads up the granite slope, past several incubating Wedge-tailed Shearwaters, to a viewpoint with a stunning vista across to nearby Cousine. 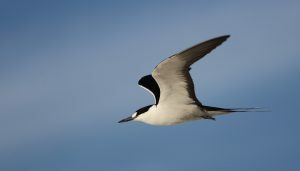 There are masses of seabirds flying around including Brown Noddies, White-tailed Tropicbirds, Common White Terns, better known as ‘Fairies’, one or two Bridled Terns and a Great Frigatebird. By now the morning has also flown by and it’s time to return to the beach for a delicious barbecued lunch back on our ‘private’ catamaran, moored in an idyllic setting just offshore of a white sandy beach, with plenty of seabirds flying back and forth. 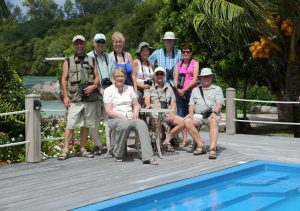 This is definitely birding in paradise! We’re on the 9am ferry to La Digue where an open truck collects us from the bustling jetty for the short drive to the ‘Veuve Reserve’. This is the home of the Seychelles Paradise Flycatcher, one of the world’s rarest birds, where, just a short stroll from the information centre, we find a family of three, showing really nicely. Mom has a black head and rich chestnut back, with an attractive pale blue eye ring, while junior looks similar but without the eye ring. Meanwhile, Dad also has the eye ring, plus a spectacular double pronged tail twice the length of his body, and when he perches on a low branch the dappled sunlight brings out his lovely indigo sheen. A little further along the short trail we find two more families of three, along with a bright scarlet Madagascar Fody and a pair of Seychelles Bulbuls posing right beside the trail, plus Seychelles Blue Pigeon and several Seychelles Fruit Bats, with gorgeous ginger coats hanging around in the tree tops. As well as the endemic Flycatcher, Bulbul, Blue Pigeon and Fruit Bat, we also find bright green Seychelles and La Digue Day Geckoes on the same tree trunk! After a productive yet easy morning, we enjoy another delicious open air lunch, followed by a lazy afternoon on the beach at Source D’Argent amid the palm trees and impressive granite rock formations. Back at the jetty for the 5pm ferry, Seychelles Swiftlets flying around the houses are yet another endemic for our special list. There are six Sanderlings on the beach first thing this morning and after breakfast we head inland to the Vallée de Mai in the heart of Praslin National Park, a UNESCO World Heritage Site with six species of endemic palms, including the unique Coco de Mer, which produces the world’s largest seed weighing in at up to forty-four pounds, after ripening for six or seven years! 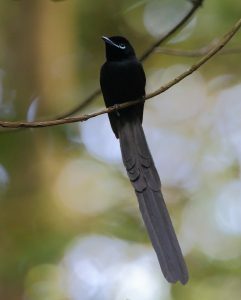 A couple of Seychelles Black Parrots are conveniently perched in a dead tree above the vallée entrance, as Seychelles Swiftlets zoom back and forth. 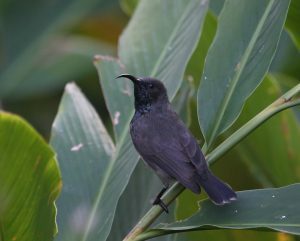 From the car park, a short walk up the road leads to a viewpoint over the forest which provides fabulous scope views of several red, white and blue Seychelles Blue Pigeons as well as more Black Parrots, perched close enough in the scope to reveal that they are actually chocolate brown. Inside the cool palm forest our excellent guide Gemma points out various endemic species of Gecko, including the bright green Praslin Day Gecko and the Giant Bronze-eyed, which is the world’s largest Gecko! Back at the Villas the Sanderlings are still on the beach as we sit down for lunch, followed by a relaxing afternoon around the pool, along with the Sunbirds and Barred Ground Doves. After four nights at the lovely Villas de Mer on Praslin, it’s time to fly back to Mahe and onward to Bird Island, where we land on the grass airstrip. Now well and truly marooned on a desert island, it’s immediately clear why this is called Bird Island, as there are birds everywhere; thousands of them, including incredibly tame Brown and Lesser Noddies and Common White or Fairy Terns, in the trees, in the air, on the ground, and even on the verandah chairs, creating a cacophony of wheezing, squeaking, trilling and cackling, by day and all through the night! This tiny island is absolutely remarkable. That rare sort of place where there is no need for a room key, a watch, shoes or a telescope, as the birds are so close. The Lodge here offers five star service and first class meals, but you have to swat the Barred Ground Doves off the table unless you want to share your meal with them! 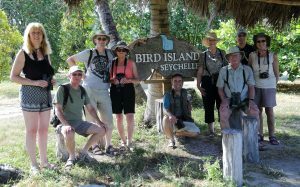 After lunch we head out to explore this amazing island, which is crawling with Moorhens, even though there is no freshwater! 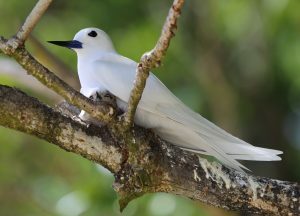 As well as White-tailed Tropicbirds nesting beside the larger tree trunks, we soon find a small group of resting Bridled Terns, although they don’t nest here. Next we head for the Sooty Tern colony, estimated to number around 600,000 pairs! The apparent chaos must have some order as each evenly spaced bird must recognise its own nest site, partner, and eventually their chick, and yet there are birds everywhere, in mega Hitchcock-like proportions, and the sound of this bedlam is so deafening that onlookers have to shout to converse! Bowled over by this awesome spectacle we now head for the farm to say hello to my old mate Esmerelda (he is actually a bloke), the world’s largest Giant Tortoise at over 6 hundredweights and thought to be up to 200 years old! What a privilege to be able to sit next to such an awesome world record holder and tickle his chin, which has the texture of an old well-worn leather armchair. We first met in 2008 and again in 2015, and while he hasn’t changed a bit, I by comparison have gone downhill fast! At the sandy northernmost point of the island, a variety of shorebirds includes Greater Crested Tern, Grey Plover, Greater and Lesser Sandplovers, Turnstone and Sanderling, with hundreds and hundreds of Great and Lesser Frigatebirds coming in overhead to roost alongside one or two white morph Red-footed Boobies. By now it’s after six and the sun is sinking fast below the Indian Ocean, leaving a delicious raspberry ripple afterglow, while the evening sky is still full of birds coming and going between the land and the sea! This morning there are Curlew Sandpipers and Greenshank to add to the bird list. Otherwise, it’s just another day in paradise, and a chance to soak up the fabulous Bird Island experience; stroking the Giant Tortoises, snorkelling with all the multi-coloured tropical fish, and even Hawksbill Turtles, in the crystal clear warm blue water, swimming in the surf or just relaxing on the beach, which is the colour and texture of pale Demerera sugar. And then of course there are always the birds. After three magical star-spangled nights on Bird Island, it is sadly time to say goodbye to the beach, the tortoises and all the birds. By now we had seen seven different terns here including Greater Crested, Bridled, Sooty, Little and Common White (Fairy) Terns, plus Brown and Lesser Noddies. This afternoon we meet Perley, our guide on Mahe, with the task of showing us the last two remaining endemics, Seychelles White-eye and Seychelles Scops Owl. We begin with the White-eye, but Perley has to work really hard to locate a pair, eventually close enough to see the whites of their eyes before shooting the cameras at a range of less than ten feet! With the ‘easier’ target bagged, we head into the densely forested Morne Seychellois National Park, arriving in time for dusk. 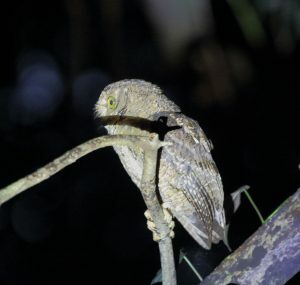 How could we possibly find a small rare owl in such an extensive dense dark forest? Just after sunset at 6.30pm, Perley plays the call of the owl and almost instantly, the strange groaning sound echoes back from the black forest and then we spot the little owl in Perley’s torch beam, perched on a dead branch right in front of us. Bingo! Suddenly the owl flits to another branch and we realise it has joined its partner and they proceed to perform a duet! It is still not quite fully dark as the owls melt away into the forest and we head back to our hotel for a delicious gourmet dinner. With all twelve Seychelles endemics now seen well, we have one last day in the field and so we begin with a pre-breakfast sortie to a mangrove with a large breeding colony of Cattle Egrets with deep pink-flushed bills and legs. Out on the mud, we spot strange Mudskippers with bulging eyes, Grey and Green-backed Herons and various waders such as Greenshank, Bar-tailed Godwit, Whimbrel, Grey Plover and, best of all, a couple of elegant Crab Plovers, looking rather like our Avocets, but with stonkingly stout black bills for crushing crabs. After breakfast back at the hotel, we head south to a small wetland in the grounds of the Kempinski Hotel, where we soon enjoy fantastic scope views of a Yellow Bittern, showing really well in the edge of the waterside vegetation. 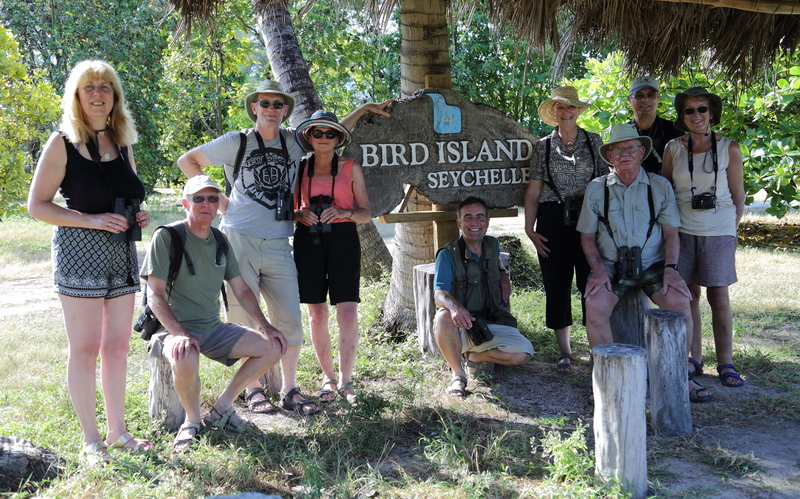 What a tremendous finale to a superbly productive, yet relaxing time birding in ‘paradise’.